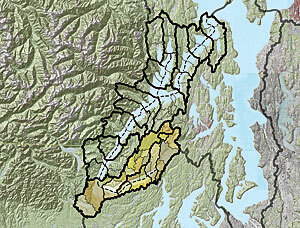 The watersheds of the Hood Canal region of Puget Sound. The landscape has a "voice," and it needs to be heard. 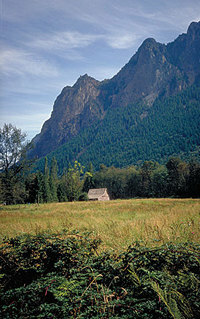 Its intrinsic assets stand there, such as Garfield Mountain on the Middle Fork of the Snoqualmie River in western Washington state, but they are not usually given standing. Every region of the country has its own intrinsic landscape forms that define its scenic character and contain its cultural heritage (in other words, the spirit of the place). Many conservation organizations are realizing that by cataloging the voice of the landscape, they can make an enormous difference in their efforts to protect Puget Sound. Seattle is just one river delta city on the shores of an immense estuary called Puget Sound, the second largest estuary in the United States, two-thirds the size of the Susquehana's Chesapeake Bay. Puget Sound extends from Olympia through Tacoma past Seattle to Everett, to Bellingham, and on to Vancouver, B.C. It is fed by hundreds of rivers and has thousands of coves and bays of islands forming its many saltwater basins. It has more than 1,000 miles of shoreline reaches that are distinctly different from each other. Each subregion has its own extraordinary scenic resources, and, together, it's a huge watershed. Groups, such as the Trust for Public Land (TPL), are recognizing the value of listening to Puget Sound to identify the landscape resources that define the identity of each region of the sound and how people value each one. During a meeting with the conservation planning team, Roger Hoesterey, Northwest regional director for TPL, states, "You can do all the science you want, but the only proposal approved is the one whose local delegation is telling its representatives what's important to them. So if you don't ask the local people what's important to them, what they care about, and why they go to a particular regionwhether it's to see the view, the beaches, the clams, or the mountain cliffsyou won't get anywhere. Ask them: 'Did you know this is the last sandpit, the biggest lagoon, and the highest mountain face in your subregion and it's got access, but it's not publicly owned?' Turn it into a compelling story with GIS." The magnitude of landscape forms contributes to intrinsic value. In 2003, TPL engaged Jones & Jones, a landscape architecture, environmental planning, and architecture firm in Seattle, to help it strategize on how to better protect Puget Sound and identify acquisition priorities. Called the Greenprint for Puget Sound, the project is a vision for the Puget Sound watershed with the goal of protecting and restoring the shorelines and open spaces of the sound's eight distinct regions. In the past, the two organizations had worked together on other projects in Puget Sound, such as the San Juan County Open Space Plan and the Mountains to Sound Greenway because of a mutual love of nature and an appreciation for the intrinsic landscape. TPL and Jones & Jones understood that the Puget Sound landscape has its own signature landformscharacteristic vegetation forms, highly visible wildlife forms, and landmark built formsthat, together, make up a cultural landscape of scenic or aesthetic quality. These landforms are the signature physiographic and landscape features that represent exceptional aesthetic resources and can be better protected. 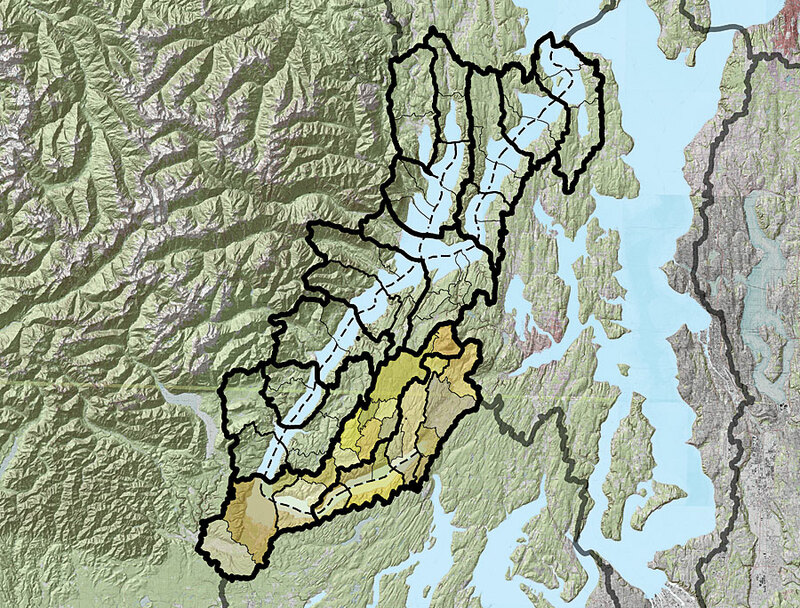 Both organizations realized that better decisions for protecting Puget Sound could be made by using GIS to "listen to the land." Jones & Jones found that ArcGIS 9 Desktop and its included ModelBuilder application are the ideal tools for rapidly cataloging intrinsic landscape resources and determining signature landscapes, which they built into a model called the Intrinsic Landscape Aesthetic Resource Information System (ILARIS). The ILARIS model [PDF-0.99 KB, 1 page] consists of 40 ModelBuilder submodels and three Python scripts organized into seven ArcGIS Desktop toolsets. Together, all the ModelBuilder models inform a decision-support framework to allow the presence, quantity, and visual properties of different intrinsic landscape forms to be captured and the significance of these forms to be identified, as well as the cumulative effect of the viewshed and the relative uniqueness of Puget Sound's landscapes. ILARIS included peer review and technical guidance from Esri; California State Polytechnic University, Pomona; the Ohio State University; the University of Minnesota; and the University of Texas, Austin. 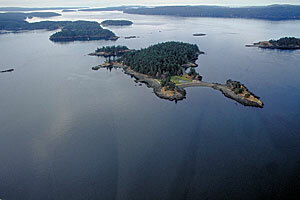 A multitude of landforms, including islands, beaches, and tombolos, are factored when determining a landscape's intrinsic value. In the end, projects that listen to the land, such as the Greenprint for Puget Sound, better identify and prioritize which landscapes are most conducive for protection. By understanding the intrinsic landscapes and shorelines that people value the most, groups such as TPL can use GIS to help reconnect communities to the water and the land. For more information about TPL and the Greenprint for Puget Sound, contact Roger Hoesterey, TPL Northwest regional director (e-mail: Roger.Hoesterey@tpl.org). For more information about how to catalog intrinsic landscape resources or to learn more about the ILARIS model, contact Grant R. Jones, FASLA, founding partner, Jones & Jones (e-mail: gjones@jonesandjones.com), or Christopher L. Overdorf, ASLA, principal, Jones & Jones (e-mail: coverdorf@jonesandjones.com), or visit www.jonesandjones.com. See also "Protecting Signature Landscapes, Natural Resources, and Habitats."